Chances are good that you already have the technology to run a more efficient practice, you just need to learn how to use it better. By the time you starting read this post today, you’ve probably already been exposed to at least ten ads promoting software or a new mobile app to improve your business. While the allure of the latest tool is tempting, would you believe you most likely already have what you need to run a better operation? You just need to understand how to use it better. Over the next seven posts I will explain how advisors can more effectively use the tools in which they’ve already invested time and money and demonstrate how to get a greater return on those investments. In other words, how an advisor can improve the utilization of technology tools. At ActiFi, we have experience with numerous advisory practices and have spent considerable time with software vendors. We’ve observed (far too often) that firms mistakenly believe that simply selecting the “best” software will solve their business issues and increase productivity with one caveat: if you don’t currently have a CRM system, you should invest in one. Having said that, the single biggest opportunity for advisors to increase their efficiency and effectiveness is to better utilize the tools and capabilities they already have access to. When you stop to think about it, 100%, not 99% or even 95%, of the business value of any technology is tied to you and your users actually using the tool effectively. This usually proves more challenging than writing a check to acquire the software/tools. 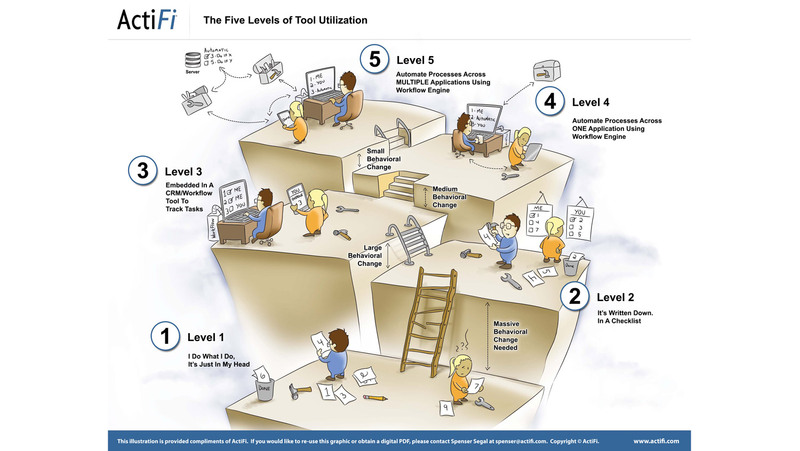 The “5 Levels of Utilization Model” shown below provides a clear visual depiction of how to gain additional value out of the investments that you have already made in technology. This series of blogs will dive into each level. Check out our next post to find out what to do when “it’s all in your head.” We’ll help you move through this and start your journey to the next level. A full-size PDF of this diagram is available upon request from ActiFi.